More than 1 billion unique users visit YouTube every single month. That’s a lot of people, right? If you’re not focusing on YouTube SEO yet, you’re missing a HUGE opportunity to build and grow your business online. Do you want to get higher rankings for YouTube videos? I’m going to reveal some of the best YouTube SEO tips in this guide so you can rank your YouTube videos fast. So what are you waiting for? Let’s jump in. YouTube SEO Tips: How to Rank YouTube Videos Fast? Whether you know it or not, YouTube watch time is one of the most important YouTube ranking metrics. So what is YouTube watch time? YouTube watch time simply refers to the amount of time people spend watching your videos. It’s similar to dwell time of a website. The more amount to time your audience spend consuming your content, the better it is for your YouTube SEO. According to the YouTube Creator Playbook, “YouTube optimizes search and discovery for videos that increase watch time on the site”. To put it simply, if you increase your YouTube videos watch time, YouTube is more likely to promote your channel through search and recommended videos, which ultimately results in more leads, traffic, more views and sales. An industry study by Justin Briggs found a strong correlation between Watch Time and rankings in YouTube search. Here’s the illustration of it. That being said, here are 5 ultimate ways to increase your overall YouTube watch time. The first 10 to 15 seconds of your videos should be really enticing to your audience. It’s better if you can convince your audience and viewers to teach what your videos all about within that 10 to 15 seconds time limit. If your videos introduction is enticing, most viewers will be watching till the end. That’s how you can increase your YouTube watch time as well. One of the reasons few videos always great reach on YouTube is because they outline their videos really cleverly. Make sure to find a proven format to outline your video content so you can make your videos engaging until the end. Not only it helps in more engagement but your viewers will be spending more time watching your videos. As you can see from the above illustration, if your video length is more than 15 minutes, your YouTube rankings will be getting better. It’s as simple as that. Did you know that you can dramatically improve your YouTube watch time by creating your video playlists smartly? For example, if someone searches for something on YouTube and then watches a series of videos with yours being the first. Every video that is watched in that series (whether it’s your video or someone else’s), will be factored into the session YouTube watch time for that content. Hope you’re getting the importance of creating playlists more effectively. First, go to your YouTube Studio and click on “Interest Viewers” and then click on the “Top Videos” to see all of your top performing and most viewed videos on YouTube. Once you know what’s working well for you on YouTube channel, you can easily create similar type of videos to create more buzz, drive more visitors and increase your reach with your videos. If there’s only one thing you need to remember while doing YouTube SEO it is this: don’t create another YouTube channel, create a brand! Have you ever subscribe to a fitness YouTube channel and found completely irrelevant videos? Chances are very less, right? Focusing on creating highly related videos for your YouTube channel is so important especially if you want to take your branding to the next level. And make sure to ask yourself what makes a video go viral online. Here’s a simple point checklist to make your videos top notch. One of the fastest ways to grow your YouTube channel is to build fans and subscribers as they always like, leave comments and share your videos with their friends. Here are few ways you can build engagement on your videos and build raving fans around your YouTube video channel. Increase video comments: Always viewers to leave comments on your videos. One way to generate comments is to ask your audience highly engaging questions about the subject discussed in the video. Subscribes: Ask people to subscribe to your channel at the end of your videos (if possible in between in your videos). Shares: Encourage your viewers to share your videos so you can get more views on your YouTube channel and also get more subscribers which is all great for your YouTube SEO. Above all, make sure to get as many likes and dislikes as possible as they are seen as an engagement metric so, the more, the better the engagement, resulting in a better ranking. Make sure to use a profile picture. Don’t use random images. It’s better if you can use your own pictures or make them something remarkable. Keyword research is the king. Both Google and YouTube search engines almost work the same way. They focus on various factors to place a piece of content (either an article or video) on their search engines. And keywords play a vital role here. Most people who are doing YouTube video marketing don’t focus much on keywords. That’s why they fail to get more views on their videos. Just like bloggers do keyword research before writing an article, you should also do the same before making a video. Just have a look at the following screenshot and you will know what I’m talking about. What did you notice from the above image? If you type the keyword (in our case, it’s SEO), you will see the top ranking results using it within their title, meta description and even in their thumbnails. That’s how YouTube determines the “concept of a video” (through keywords). That’s the reason why you should be doing primary keyword research before you begin creating videos for YouTube SEO. Here are some of the best SEO tips that will help you do better on YouTube SEO. Make sure to come up with a primary keyword. Preferably with a long tail keyword as they generate the majority of the traffic. Instead of trying to rank for a broad term like “SEO”, you can get better rankings on YouTube by using a keyword like “SEO tips for New York agencies”. Use tools like SEMrush for coming up with keyword ideas. Yes, you can use free keyword research tools like Google’s Keyword Planner but it doesn’t really show you potential keywords. Here’s where premium SEO tools like SEMrush can help you in finding the most profitable keywords that drive more traffic to your YouTube videos. While doing keyword research for YouTube SEO, make sure to analyze your competitors. Find out who are all already ranking on first page results on Google for your targeted keyword. Find out why they are ranking on #1 page results. Find out their average video length. This simple analysis can help you a lot while making videos to boost your online growth. If you’ve subscribed to Bloggers Passion YouTube channel (if not, please subscribe to it as we’ll be talking mostly about SEO, making money and blogging related stuff), you will notice that our videos are always optimized both for search engine crawlers and people. If you want to get better rankings for your YouTube videos, make sure to focus on the following 3 things. Let’s now talk about them briefly so you can easily optimize your videos for YouTube SEO. Make sure to optimize your YouTube video title as it carries more weightage by crawlers. Include your primary keyword (see step #1) in your title. If possible, use your keyword in the beginning of your video title so both people and search crawlers can easily understand what your video is all about. Just like title, the meta description (the description of your video) plays a HUGE role in YouTube SEO. So make sure you’re spending good amount of time in crafting the right description for your videos. Use links to specific pages (either to your own websites or products) within your meta description and add them in the beginning of your description so people can quickly decide where to go after watching your videos on YouTube. Most people ignore tagging their videos with keywords. If you want higher rankings for your videos on YouTube, you shouldn’t ignore your video tags. Instead of using random tags, use relevant tags that are perfectly suited for your videos. For instance, if you’re talking about SEO tips on your videos, you can use tags like SEO tips, search engine optimization, how to get better rankings on YouTube etc. There’s no rule of thumb in how many tags to use in a video but you can use tags anywhere around 5 to 10 tags for better YouTube optimization. One of the easiest YouTube SEO tips to get higher rankings and find PROVEN video ideas which go viral online is to perform competitor analysis. Make sure to come up with a list of at least 10 to 20 of your competitors channels so you can easily analyse how you can come up with better content ideas for your Youtube channel. That being said, here are two solid reasons to check out your competitors channels on YouTube. Let’s talk about the above things in brief so you’ll understand the value of competitor analysis and use it as one of the best YouTube SEO tips to grow online in 2019 and beyond. By spying on your competitors channels, you will instantly get keyword ideas on how much visits they are getting and how they are ranking on YouTube and Google search. You can also use tools like SEMrush where you just need to enter the keyword and it will automatically suggest you long tail keywords and short tail keywords. Once you have found these keywords, then add them in the tag section of your videos. Not all contents are the same. There are few content ideas that go viral in your industry. So you can easily figure out what kind of videos are getting real engagement by looking at your competitors video channels. Here are some of the best YouTube video metrics which play a VITAL role in your YouTube SEO. So how can you increase your YouTube video metrics? To be able to increase your YouTube watch time and average duration (also time spent on your videos), make your videos as enticing as possible and make sure they are long enough so you can dramatically improve the average time spent. To be able to get more comments, ask questions at the end of your videos and also make sure to ask your subscribers and viewers to leave comments as it work like a charm. If you want to get more likes for your videos, you need to really do one thing well and that is to create engaging videos. If your videos contents are great, almost everyone starts liking your videos while watching your videos. You can also use call to actions and annotations like “give it a thumbs up” to increase your likes on your videos. Pro tip: Sync your YouTube account with your social media accounts such as Facebook and twitter. That way, anytime you post a new video on your YouTube channel, it will automatically get published across your accounts. One of the advanced YouTube SEO tips used mostly used by experts is this: optimizing around video keywords. Ranking in YouTube is great but ranking your video on both YouTube and Google is even better. Let us show you with an example. When you type in “yoga for back pain” on Google search, it will first show the video results. Look at the below screenshot. 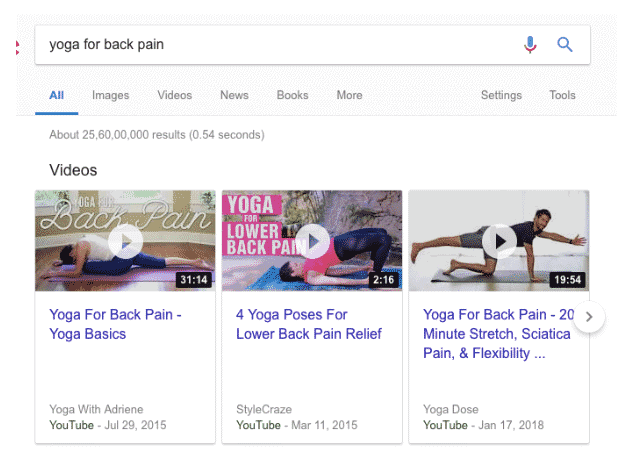 As you can see from the above example, “Yoga for back pain” is a video keyword which means, you’ll not only ranking on YouTube but you’ll also be getting visitors from the world’s biggest search engine which is Google. Finding such YouTube video keywords can literally change the game and generate a ton of visitors to your sites easily (as you’ll be getting traffic from world’s two of the biggest search engines which are YouTube and Google). So how can you find such video keywords? Here are few quick YouTube SEO tips for you if you want to find video keywords that rank both on Google and YouTube. Find topics which are focused on beginners. For example, beginner topics like “yoga for back pain”, “how to lose weight” etc will work like a charm in getting visitors from both Google and YouTube as they are mostly video keywords. Before deciding on a topic or keyword phrase to create your YouTube video, make sure to check if there are video results on the first page on Google search. If you find any video search results (as demonstrated in the above example), you should definitely consider such topics because you can easily get your video ranked in both the search engines Google and YouTube. Last but not least, use tools like SEMrush to easily come up with video keywords as you can also find how many of your target keywords are getting featured snippets, backlinks etc at one place. One of the less known ways to get more organic reach to your YouTube videos is to get links from other sites. The best way to do that is to get more people to embed your Youtube videos on their sites. Here’s a simple step by step tutorial on how you can do it right. The first step is to find a list of all the sites which have related topics to your videos. The key here is to already have a list of sites along with the URLs in a spreadsheet so you can get in touch with the blog owners as soon as you publish videos on your YouTube channel. Always remember one thing when it comes to online “don’t ask for favours before you offer help”. You don’t get help from strangers. So you need to really spend some time with other bloggers and vloggers in your industry and start interacting with them. Make sure to promote them, leave comments and do everything you can to offer help. Here’s a sample email pitch you can send to other bloggers who have posted similar type of content on their sites. How are you doing buddy? I just read your article [Article Title]. The content is really top notch but I think there should be a little more to make it outstanding and valuable for your audience. What can be better than a YouTube Video? Well, I just want to share that I’ve made a video on the same topic and I would be glad if you can embed it within your post. Feel free to ask any questions. Looking forward to hearing more from you. If you can see the above sample email pitch, it’s short and also to the point. As a rule of thumb, you can expect at least 5 links from every 100 email pitches you send to other bloggers to embed your videos on their site. That’s it, you’re done. Once they start embedding your videos (most will do if your videos are relevant to their content and useful to their audience), you’ll start seeing organic growth for your search results both on Google as well as YouTube. Want to practice the best YouTube SEO tips to get higher rankings? Then, create buzz around your videos. Why? The #1 reason is: the more people who talk about your videos (or who share your videos with others) the better rankings you can get. If you’re wondering about how to create buzz around your videos, here are few places you can try. Even if you’re a YouTube marketer who is only using YouTube to create videos, make sure to create a blog. Why? Blogs are really helpful in getting top rankings. You can use your blog to build an email list, to create buzz around your videos, to link to your YouTube videos and to increase traffic to your YouTube channel. If you already have a blog, make sure to drive as many visitors as possible from your site to your YouTube channel. You can create specific blog posts around your YouTube videos or you can simple use your sidebar or footer to let your audience know that your channel exists. There are a ton of forums ranging from marketing to SEO to fitness. Simply use search strings like “your video topic” + “forums” on Google to find relevant forums in your in industry. Forums are great places to begin with if you’re just starting out. If you’re new to YouTube video marketing, you know how important it is to get initial audience and feedback. Forums give you an opportunity to really connect with other bloggers and YouTube marketers. That’s how you learn and implement successful YouTube SEO tips to grow your business online. Quora is the #1 platform for Question and Answers. You can find the best answer to almost any question on Quora. It’s the platform that’s been used by millions of people worldwide. This platform also helps you find great topic ideas to create videos. See the image below to understand what I’m talking about. Just find and follow topics on Quora that are relevant to your YouTube channel and start writing answers to help others. Occasionally, you can use links to your videos from your Quora answers to generate buzz online. You can also use other marketing channels like Facebook, Twitter, Instagram etc to drive more visitors to your YouTube channel to watch your videos. There are literally thousands of promotional ways to promote your videos if you have enough time. 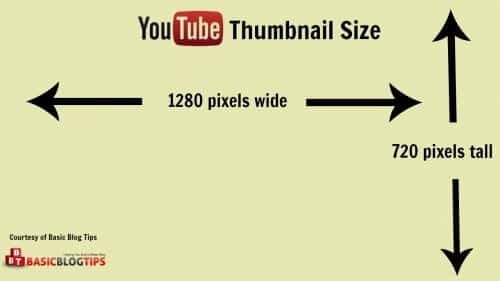 The thumbnails in your videos play a crucial role in getting more clicks. The more clicks you get the better rankings you get for your videos. So use appealing thumbnails. Make sure to have a resolution of 1280 x 720 (with minimum width of 650 pixels) to give best thumbnail experience to your users. Upload your images in quality image formats such as .JPG or .PNG. You can also resize your images before uploading them onto YouTube for better SEO. 9 out of 10 people read your headlines before clicking on your videos. So don’t ignore them at all. Here are few headline samples that work almost every time. What’s the best way to get more views on your YouTube videos? Simple, increase your subscribers. Find out ways to get more subscribers to your YouTube channel. As we discussed above, use forums, Quora, blogs etc to promote your channel to get as many people as possible. If you have just started creating videos, one of the simple YouTube SEO tips to get more attention to your channel is to leave thoughtful comments. That’s how you get the initial traction to your channel. Most people ignore this but the best way to get more exposure to your channel is to simply ask others to share your stuff. In the beginning and ending of your videos, ask people to share your stuff. Also ask your friends and colleagues to share your videos on other social media sites to get more exposure. Last but not least, make sure to create a long term strategy for YouTube SEO. I’ve been doing SEO for a long time now and I know one thing about SEO: you don’t get better results or rankings quickly. It takes time to get higher rankings for YouTube videos. So it’s better to focus on 1 year strategy and keep a consistent video posting frequency (once a week or twice a month) if you want to really get the best results from YouTube. Also make sure to acquire as many subscribers as possible to your YouTube channel as your subscriber count plays a huge role in following things. So find out various ways to get as many subscribers as you can to your channel. That’s how you succeed in YouTube video marketing. Focus on long term goals instead of short term results. Read: How Much Money Do YouTubers Make In 2019? Here are few important questions about YouTube SEO tips for 2019 which can be useful and can come in handy to get noticed with your videos. 1. What are the best YouTube SEO tools I can use? If you’re looking for the best tools to promote your Youtube videos, here are few of them which work like a charm. 2. What are the Youtube SEO best practices for 2019? One of the best YouTube SEO practices is to increase your Click-Through Rate (CTR). You can boost your CTR by having compelling titles and thumbnails. Pick something that makes your video search result stand out from the rest of the videos. Here are few more quick YouTube SEO best practices for 2019. Make sure your video titles that are 55 characters or less and also use meta descriptions that are 155 characters or less. You can even write longer description depending upon your video and content type. Always spy on your competitors videos. Find out how they are promoting their videos, optimizing their videos and notice their video length as well to really find some interesting insights. 3. What are the interesting YouTube stats? According to Tubular insights, 68% of YouTube users come to the platform for help in making a purchase decision. That’s the reason why you see both vloggers and advertisers doing a ton of product reviews on Youtube. In addition to that, Google loves YouTube. In 20% of cases, extended snippets of video are displayed in the search results. Here are few more interesting stats about YouTube. That said, here are few interesting YouTube stats you might want to know. Daniel Middleton, known on YouTube as DanTDM, has more than 17 million subscribers to his channel of gaming videos. The top 10 highest-paid YouTube stars combined earned $127 million, according to Forbes. 4. What are the best video marketing SEO tips? Here are few quick video marketing SEO tips you can use to amplify your marketing strategy in 2019 and beyond. Above all, make sure that your videos are long enough to keep your audience interested. According to statistics, videos that are more than 15 minutes long are ranked better on YouTube. 5. How to increase youtube rankings quickly? Do you want to know how to increase youtube rankings really quickly? We’ve a quick tip for you: create longer videos. Longer videos rank higher on YouTube, probably because they are supposed to be insightful and provide extra value to the audience. According to a study conducted by Backlinko, “the average length of a first page YouTube video is 14 minutes, 50 seconds”. So start creating long videos to be able to increase youtube rankings really quickly. YouTube SEO is NOT easy. You need to learn latest YouTube SEO tips and keep up to date yourself with trends to rank higher. It’s also not a rocket science to get higher ranking for your YouTube videos. All the five tips mentioned in this post are highly practical to implement and I guarantee you can get 1st page rankings on YouTube by following them. So what are you waiting for? Have you already started YouTube video marketing? Do you have any more YouTube SEO tips to get better rankings on YouTube? Share your thoughts in the comments. This is really great tips for YouTube SEO but today YouTube is not good for genuine YouTubers. I have seen many big YouTubers who are just doing anything for the sake of money. They are misguiding to newbie YouTuber. I read your articles, when I see them, I find it genuine but just search anything on YouTube. You will find copy content only. May be I am wrong but it’s my person opinion. That’s why I always prefer work on Websites rather than on YouTube. YouTube is working hard to stop them all. Hopefully soon we will get only genuine content on YouTube. Hi Anil, it’s so true that many people are jumping into YouTube for the sake of getting more clicks (or money). Eventually all such people will fade away with time and only those bloggers will succeed who are consistently producing quality videos. As you said, hopefully everyone gets genuine content on YouTube. Thanks for the comment. Hi! It’s really useful. Thank you for this information. What can u say about SERPstat, for example? It’s really important to me not to waste money now. Serpstat is a fantastic SEO tool which is also affordable, it costs you just $19 per month (you can read our read here: https://bloggerspassion.com/serpstat-review/) where you can find all the details about it along with its features and pricing plans. Let me know if you’ve any more questions. An awesome post indeed. I guess we need to get on videos to get our blog promoted and can use blog to promote videos – both can go hand in hand. What more? We can make money on YouTube as well. I do agree with you – creating long term strategy will work and we need to be persistent on creating videos. Yes, that’s true. You should be considering both channels, blogging and vlogging if you are just getting started. That’s how you can quickly find out which one is working well for you. YouTube is great for vlogging and make sure to research your competitors channels to see what kind of videos they are making to get noticed online.